To give you an idea of what it is like to be a Smart Betting Club member, we have put together a fresh new FREE SBC magazine, featuring lots of our recent content for you to enjoy. 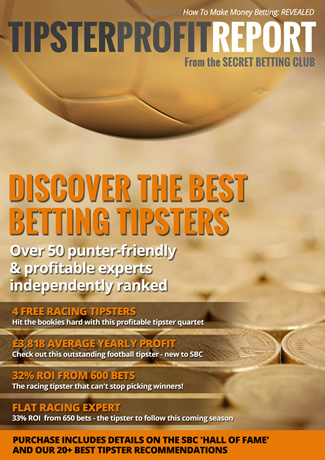 It features 3 full tipster reviews as originally published in recent SBC Magazines, plus an interview with one of our most profitable members AND a sample article from our ‘Practical Punter’ series. More On These 3 Tipsters…Plus 50 More! This special free magazine should help to give an insight into the quality of content we produce for all Smart Betting Club members. We go into detail on every tipster we review, taking our time to analyse all aspects of their service – with the goal of uncovering the best, most genuine tipsters out there. Since the original reviews were published, all 3 of the tipsters included have gone on to make even more profits and showcase their ability further. It’s one reason why 77.9% of SBC members reported a profit betting last year. You can find the latest info on all 3 of these tipsters, plus details on 50 more we have reviewed in a similar vein, within our regular Magazines and Tipster Profit Reports. Click here to sign-up as a Smart Betting Club member today. How To Make Lucky 15s Even Better! In this special article, guest author Thomas Randall talks us through how you can make your lucky 15 bets even better! Bookmakers hate taking Lucky 15s and here is why. The bet was actually withdrawn from betting shops many years ago only to be reinstated when customers left chains in droves to go to independents that still accommodated it. So wait a minute, I can hear a few of you saying ‘what is a Lucky 15 bet’? A Lucky15 is a series of bets that covers 4 selections (usually on horses). It consists of 4 singles, 6 doubles, 4 trebles and an accumulator, 15 bets in total, hence the name. Ok, so what’s so great about that? The beauty of this bet is the way it is marketed by the bookmakers. Because 15 bets is a lot of cash to lay out (especially if they don’t all oblige, most bookmakers offer a consolation of double the odds for one winner only in your 4 selections and some like Betfred even offer treble odds). There are many shrewd ways of exploiting these consolations in the Lucky 15 bet to your advantage as a punter. The first way which is quite well known is to do the Lucky15 each-way with all the selections in races where the place terms are weighted in the punters favour. For example, a Lucky 15 where all the selections are second favourites in non-handicap races of 8, 9 or 10 runners where the favourite is a very skinny price (6/4 or shorter). The shorter the price the favourite is in fact the more advantageous the place terms become for the punter in that type of event. Place the bet as late as possible checking which horses are likely to go off second favourite by monitoring Betfair. Also, make sure none of your selections are non-runners because you will not get a consolation (double/treble odds one winner or placed selection) if one or more of the four selections fail to take their chance. When you pick your four selections out try to find one more horse as well but instead of doing a Lucky 31 (A Lucky31 is similar to a Lucky15 but with 5 selections consisting of 5 singles, 10 doubles, 10 trebles, 5 four-timers and an accumulator) do 5 Lucky 15s permed in the following way. Ok, that is 75 bets so far. Let us suppose we had done a £1 Lucky 31 instead. That is £31 total outlay obviously, and if you only get one winner which is probably the ‘average’ result for punters on a typical day then you get treble the odds for that selection. If your winner was only say 4/1 then you’d of got treble odds making it 12-1 and your return £13. However you could instead divide your original outlay of £31 by 75 and have 5 lucky 15s with a unit stake of 41.333 pence permed in 5 slips. Now look what happens if you only get one winner. The 5 slip permutation with one winner will have that one selection in four of the slips. For example, if A is your only winner it appears in slips 1,2,3 and 4. If A was a 4-1 winner then if you got double the odds a winner in your Lucky 15 you would get back 41.333 pence at 8-1 on 4 slips or £14.88 which is more than £13 is it not? If the shop you go in pays treble the odds (such as Betfred) then you would of received 41.333 pence at 12-1 on 4 slips and that is £21.49, which is getting towards double £13 is it not? There you are ladies and gents all you need now are the right selections and you can start hammering those bookmakers! If there is one thing that unites us all – its the love of a bargain or a freebie, which is why I want to highlight some of the mega deals now available via the our ‘SBC Discount Club’ off the cost of many tipster subscriptions. You can save up to £188 on the price to access a variety of popular tipster services via these special deals and free trials – many of which are exclusive to our club. In fact, so potent are some of these discounts, that they can easily save you more than the cost of joining us here at the Smart Betting Club! Which, as Kevin Bacon would say – is a massive ‘no-brainer’. Longevity is not usually a word readily associated with tipsters and with good reason, as many have a reputation for packing it in as soon as a bad run of form hits. One notable long-running tipster service goes by the name of Winning Racing Tips and has been run by Paul Ruffy since July 2006. We have been tracking it ourselves since 2007 and updating SBC members on its ongoing profitable performance ever since then. In recognition of this longevity, we recently sat down with Paul as part of our ‘How I Make Money Betting‘ series – to try and tap into just how he has been so successful for so long. The very latest Smart Betting Club Tipster Profit Report is out now and features the latest results for 53 of the very best betting tipsters we have uncovered in nearly 8 years of independent reporting. In each unique report you can find tipster league tables, ratings and ‘Hall of Fame’ listings, all aimed at helping YOU identify which often little-known tipsters are genuinely profitable. Are These The 4 Best Free Racing Tipsters Out There? This week represents the calm after the storm for many gamblers after the craziness of Cheltenham..and if you lost out during the festival, I’m here to help with news on 4 FREE top racing tipsters you should check out. After all, everyone loves something for free but never more so in the aftermath of Cheltenham – be it because you spent all your money on Guinness or simply because you backed a string of no-hopers. The greatest racing festival of all is now just a few days away and to further whet the appetite ahead of the start of Cheltenham this Tuesday, I have brought together a panel of 4 of the shrewdest racing brains to get their best Cheltenham 2014 Tips. Fielding my questions were 4 times Racing Post naps champion and Easyodds columnist – Paul Jacobs, top racing writer and owner of the geegeez website – Matt Bisogno, SBC’s very own racing expert – Scott Armstrong and the highly-rated racing tipster – Rob from Pounds to Punters. Our hotly anticipated Cheltenham 2014 Tips Profit Pack has today been published and is available for free download – perfect for those of you looking for tips, guidance and advice during the famous festival. It is completely free to download and you can obtain your copy by visiting our special Cheltenham Tips 2014 website.